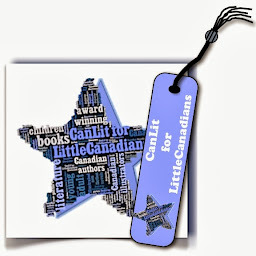 The beginning of the year is a wonderful time to catch up on hidden gems that I missed last year, especially ones that were released at extraordinarily busy times or at incongruous times, like a winter book in the spring. 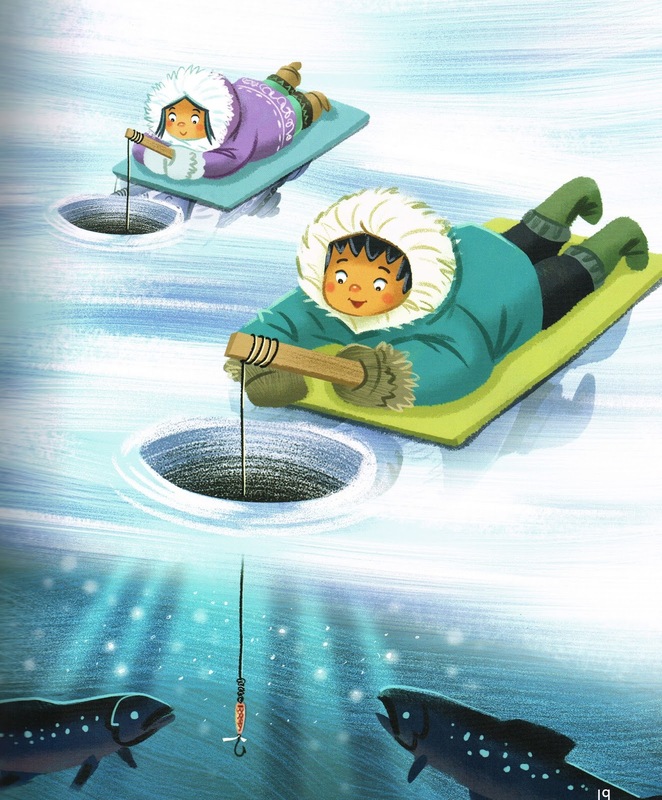 To that end, I am so pleased to review Fishing with Grandma, a marvelous picture book that provides a glimpse into Inuit traditions of fishing and food and the important role of female elders in the family and community. A young boy and his sister go to visit their grandmother, Anaanatsiaq, in search of an adventure. 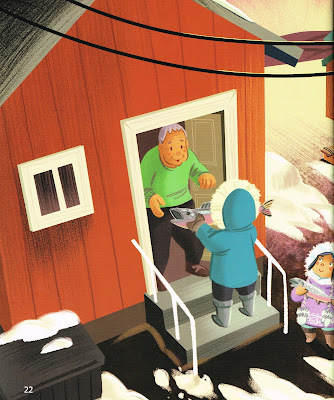 With the house smelling of bannock, the children playing string games, and their grandmother sewing a sealskin, with her ulu on the ground beside her, the setting will be familiar to many Inuit but eye-opening for many others. The children ask their anaanatsiaq to take them jigging for fish, a type of fishing the uses a jig or a lure. Their grandmother instructs them how to dress appropriately for the outdoor activity and then loads up the ATV with the appropriate equipment and they're off. While teaching her grandchildren how to test the ice for walking, how to make holes in it, and the movements of the wrist necessary to entice the fish, Anaanatsiaq introduces them to tools such as a tuuq, an ice skimmer, a jigging stick and an ice probe. But it's the excitement of the sounds of the ravens and other fisher people jigging from their mats and of the sights of fish swimming by, as well as the thrill of the catch that elevates the outing to an adventure. 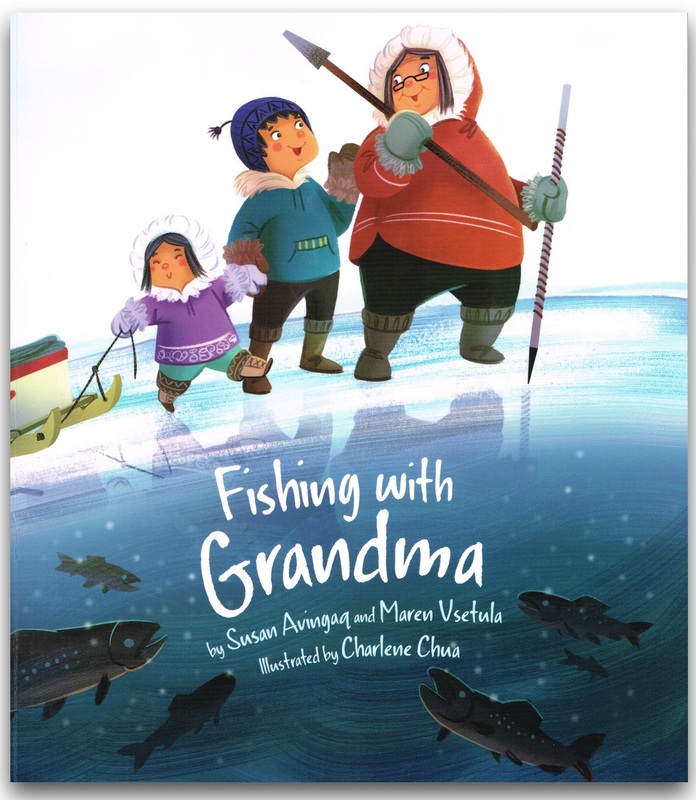 The story of Fishing with Grandma balances the blending of old and contemporary cultures with a special intergenerational relationship, making it a wonderful story for teaching acceptance and cultural competence. I love the children's grandmother, wise in tradition and facility, knowing the right thing to do and with the right tool. I suspect that Nunavut author Susan Avingaq learned from her own grandmother just as she now would take her own grandchildren fishing and camping to teach them important land skills. Susan Avingaq and Maren Vsetula's text of Fishing with Grandma is like Grandma herself, forthcoming without preaching, modelling acceptance and wonder and a joie de vivre. 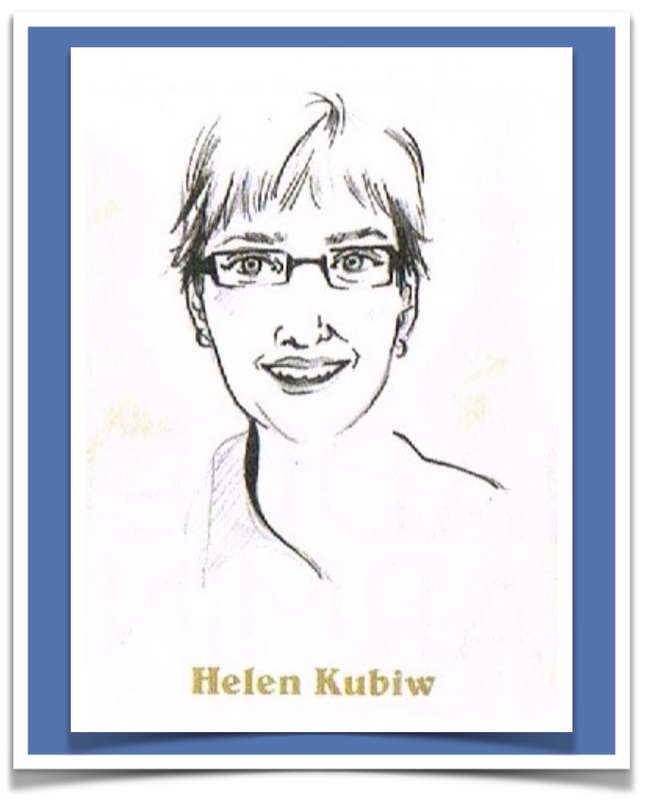 Illustrator Charlene Chua, whose artwork in Akilak's Adventure (Inhabit Media, 2016) drew much attention, keeps the children's admiration and fascination for their grandmother and the adventure elevated as she does for young readers of the story. Most importantly, the essence of being Inuit, from going jigging and sharing their catch with the community, is always uppermost in the story's text and illustrations, both teaching and entertaining readers of all cultures. I'm so excited for this one! It's so important to have stories that blend traditional and contemporary indigenous cultures. 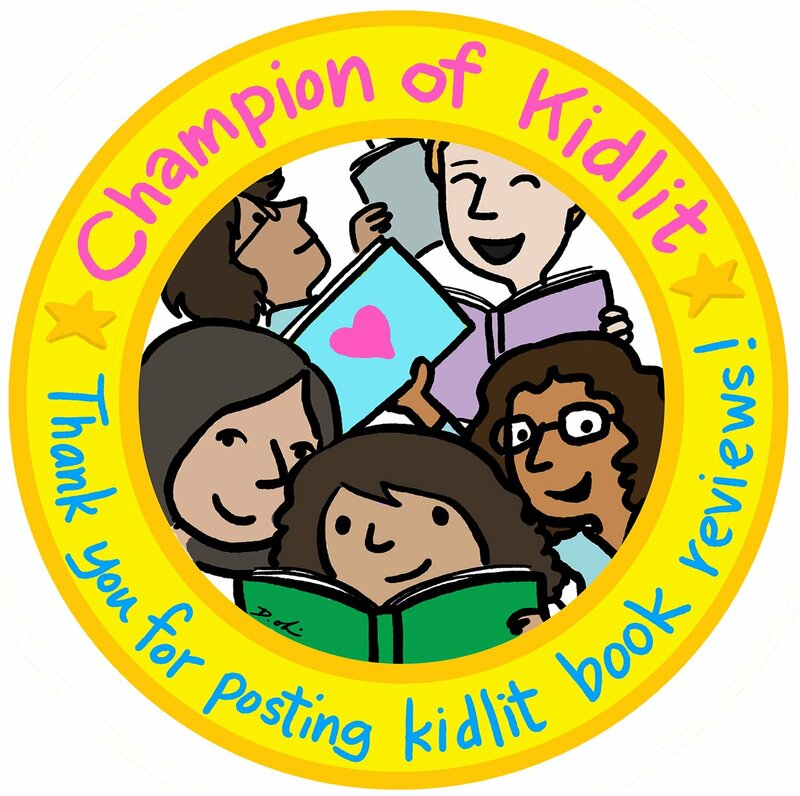 So many indigenous books feature indigenous history, which is important, but it sometimes gives young readers the impression that indigenous peoples are a part of the past, and not a thriving part of our present and future! Well said, Jane. I remember using a 1994 movie "Frostfire" with Wendy Crewson in class in the 1990s to help teach Aboriginal Perspectives because there was so little out there as a teaching resource. The movie contrasted the traditional and contemporary cultures amidst a thriller plot. Nice to see publishers like Inhabit Media and Fifth House, as well as others, have now taken up the cause so eloquently.